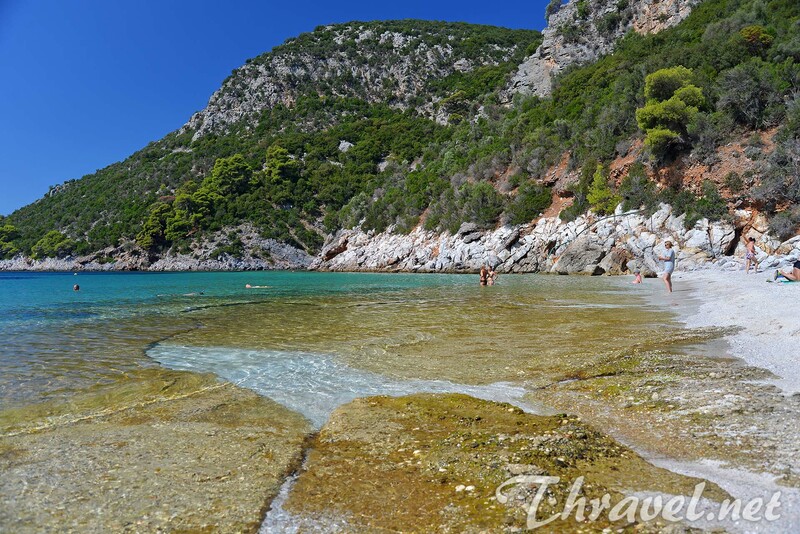 If you hesitate to go on vacation to Greek Skopelos or rather to nearby Skiathos island, my blog can help you. 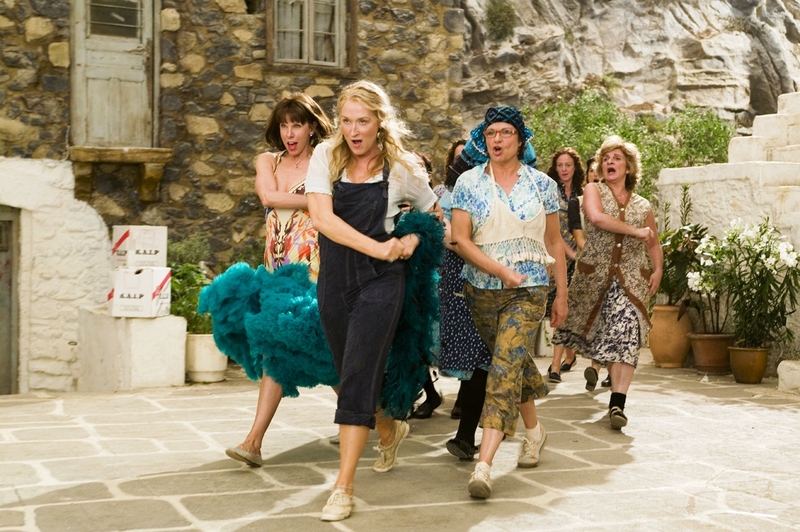 The islands became famous for the musical “Mamma Mia!”, which was filmed here in 2008. 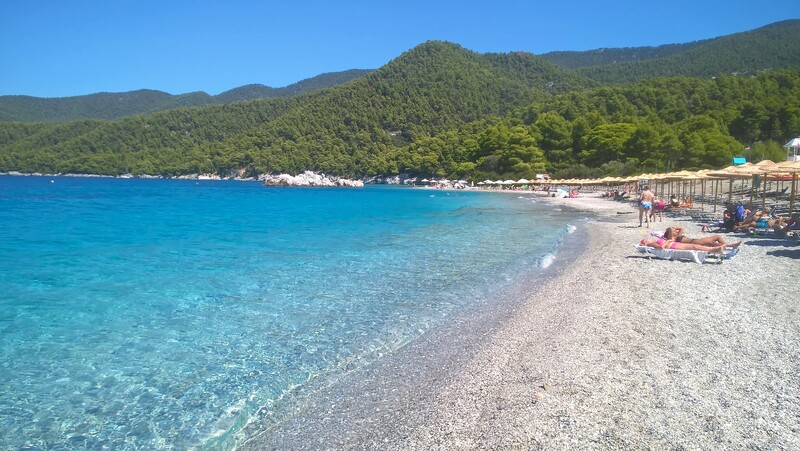 Both islands look differently and there are some false myths on the Internet, especially about Skopelos, so it´s good to study a bit before you decide where to go. 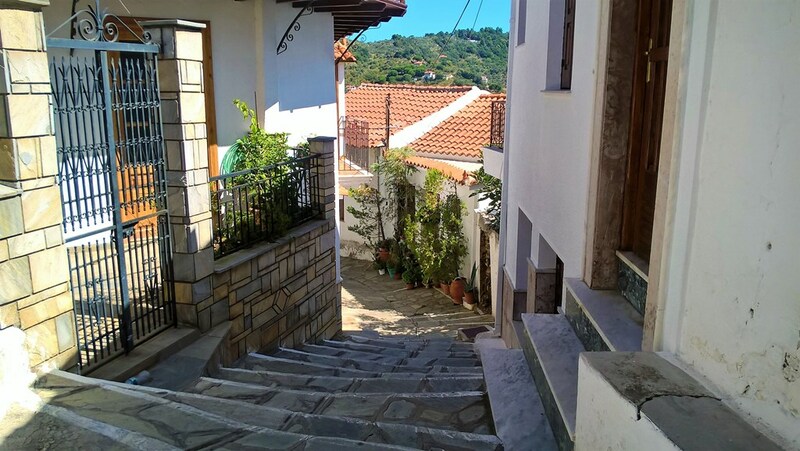 I was last summer in Skiathos – you can read all about it here. And this year I visited Skopelos so I can provide a valid comparison and information. Really? And when? I´ve read this utopia several times on the Internet. 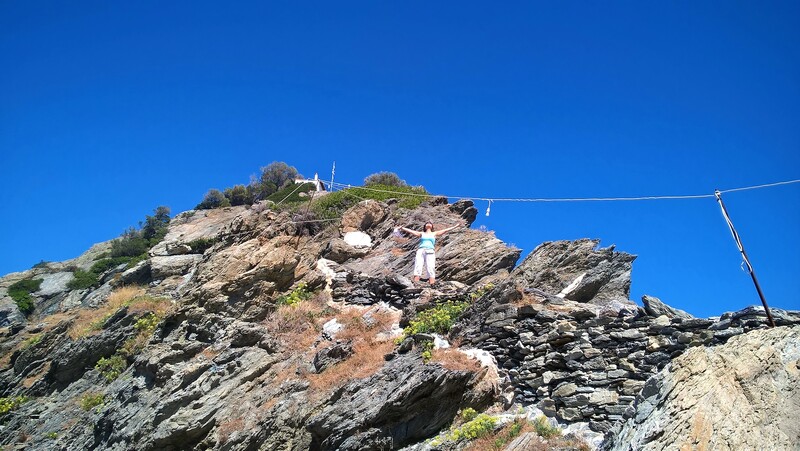 The writers claimed because there is no airport in Skopelos and you have to go there by ferry from neighbouring Skiathos, there are significantly fewer tourists. Maybe I wasn´t just lucky but I have totally different experience. 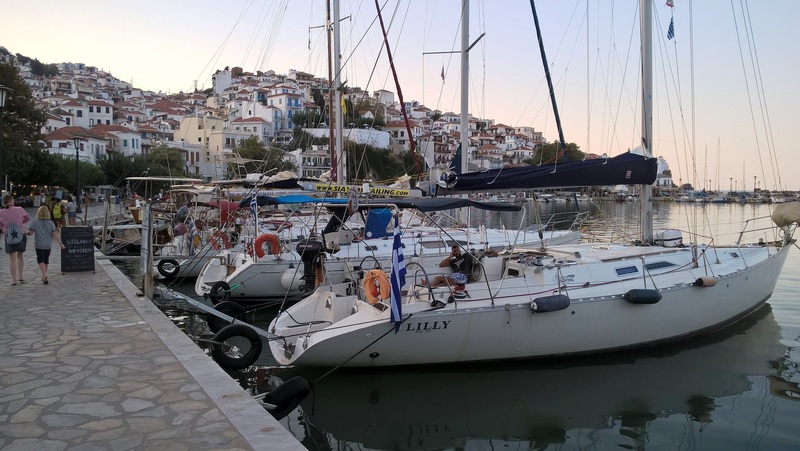 I arrived on the 25th of August, when the season began to come to an end (the season is short because of the location – read about it here) and I had a shock to see all the feryboats full of tourists coming from Skiathos to Skopelos. 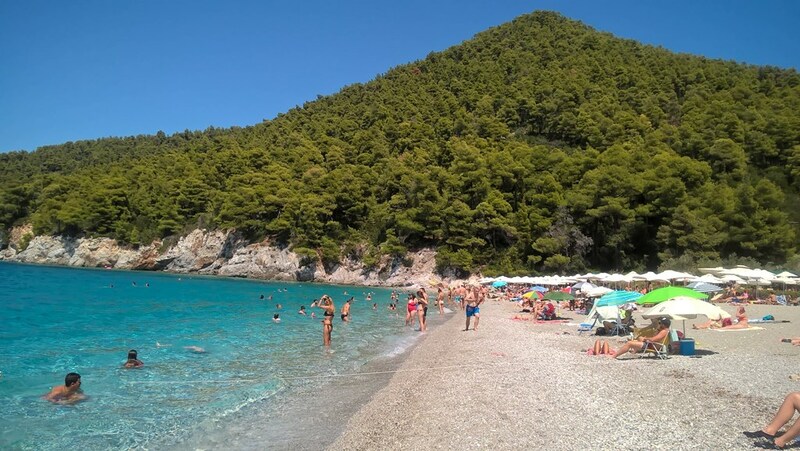 Skopelos and all its beaches, parking spaces and restaurants, were very crowded until the 1 st of September. The “smaller brother” Skiathos is also crowded during July and August but beaches are there much larger than in Skopelos so you don´t feel like canned sardines there :-). So in my view, Skiathos is much better. This is certainly not true. 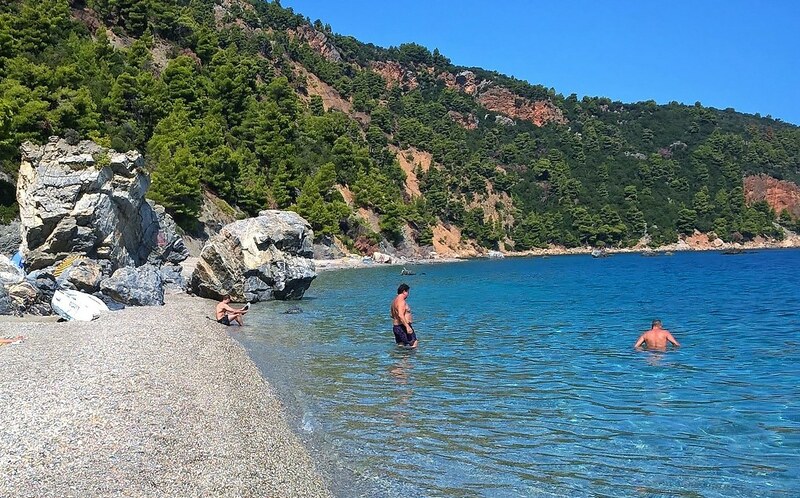 There are a lot of lovely beaches but only stony with pebbles in Skopelos. There are no sandy beaches at all. Our guide from travel agency Firo tour claimed that the only sandy beach is Limnonari. I am not sure if the guide has ever visited this beach. Surely Limnonari is a lovely bay with a nice bar, not too crowded, but the entrance to the sea is perhaps the worst that can be found on this island. Entry into the sea is covered by strips of huge, flat stones, so there's no way to talk about a sandy bottom. There is only a sandy area for sunbathing. See the photo below. My friend recommended me Velanio beach (one part is for nudists) when I love sand, but unfortunately even Velanio is not sandy, it is a typical pebble beach with smaller and bigger stones in the sea. I have no explanation why people say that some beaches are sandy in Scopelos :-). Perhaps they love this island so much that they want to make the best promotion. I drove the entire island by car and I can honestly say there is no sandy beach anywhere. 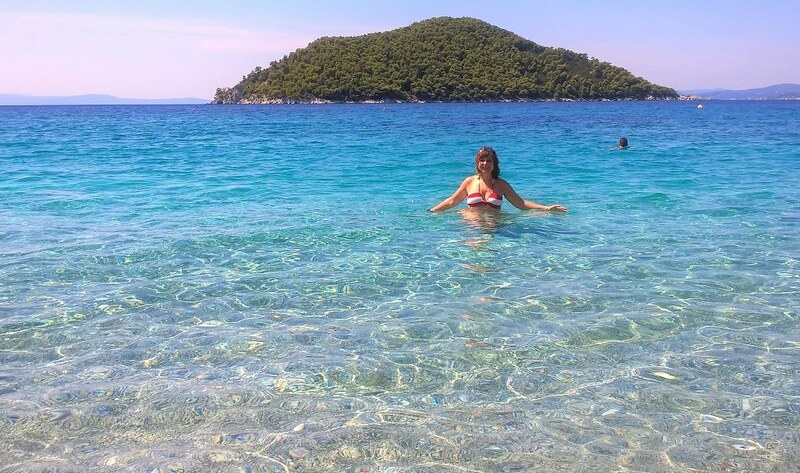 So the conclusion is - if you really don´t like stones and pebbles in the sea and you want to enjoy fine sand then definitely go to Skiathos. 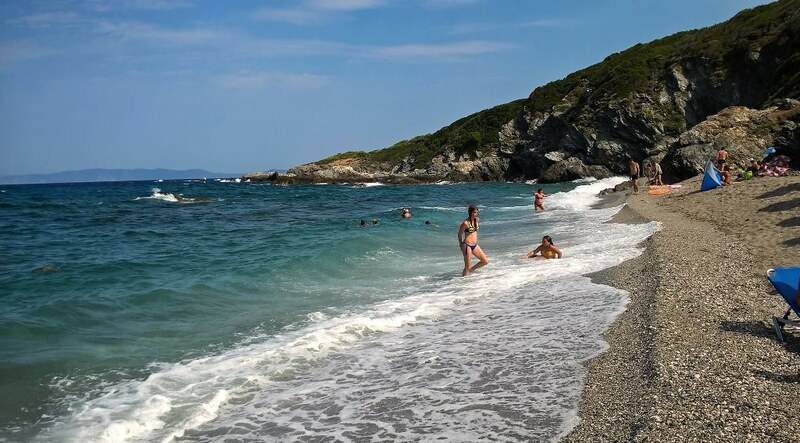 Perivoliou beach (on the north, near Glossa) - the beach is stony and journey by car isn´t easy. Only for good drivers! 1. 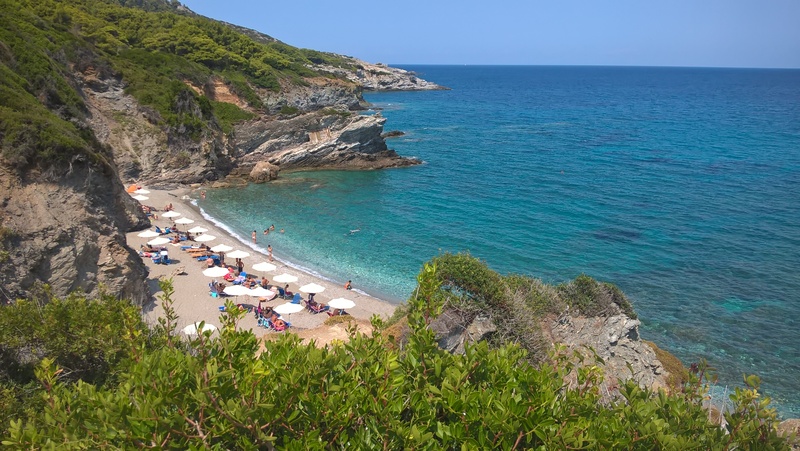 Skopelos is picturesque, hilly and very green island (there are extensive pine forests) with a pleasant climate. There is not too hot even in the high season (July-August). 2. The sea is clean and totally transparent in the most beaches. Thanks to many rocks it is a good place for snorcheling. 3. There are no vendors who disturb you while you lie on the beach and make you buy unnecessary things (we have met just one guy from Zimbabwe during our 10-days of stay). 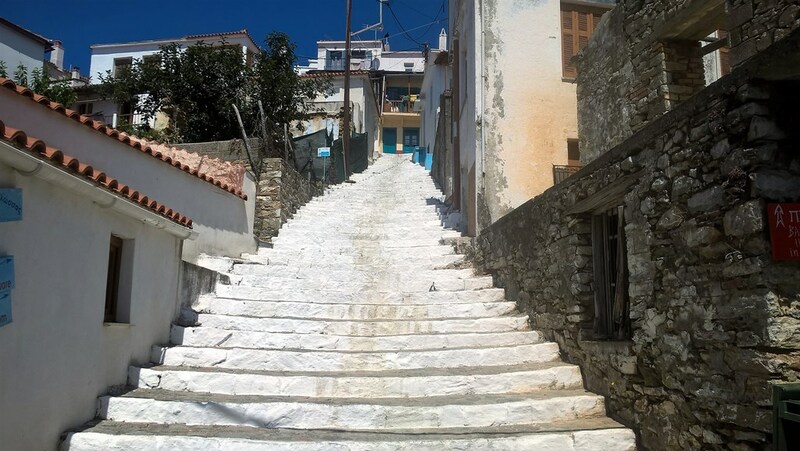 You can´t visit Skopelos without climbing up to this dominant feature of the Old Town (Chora/Kastro)! Built on the cliff, the white church Panagitsa of Pyrgos, a blend of Byzanthine and Venetian influences, is a real jewel. 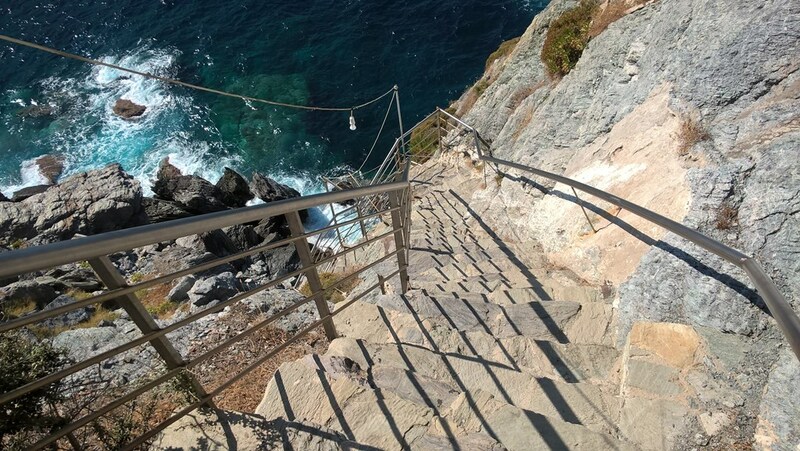 After a moderate climb, you will be rewarded with a breathtaking view of the emerald sea, the island of Alonissos and red roofs of the houses. Half way up you can relax in a nice outdoor coffee bar under olive trees. If it is too hot during day, it is more pleasant to go up during sunset and enjoy the beautiful view. You can have a dinner on the top at Anatoli restaurant and you can enjoy rebetiko music alive as well (rebetiko or rembetiko - the urban popular song of the Greeks, especially the poorest, from the late 19th century to the 1950s). 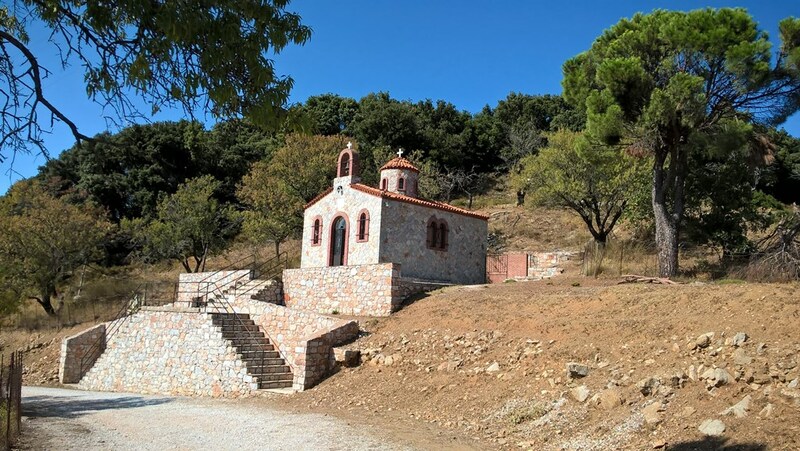 Landmark of Skopelos - the church Panagytsa or Pargos. Walking up, when a day is hot, is quite a challenge! 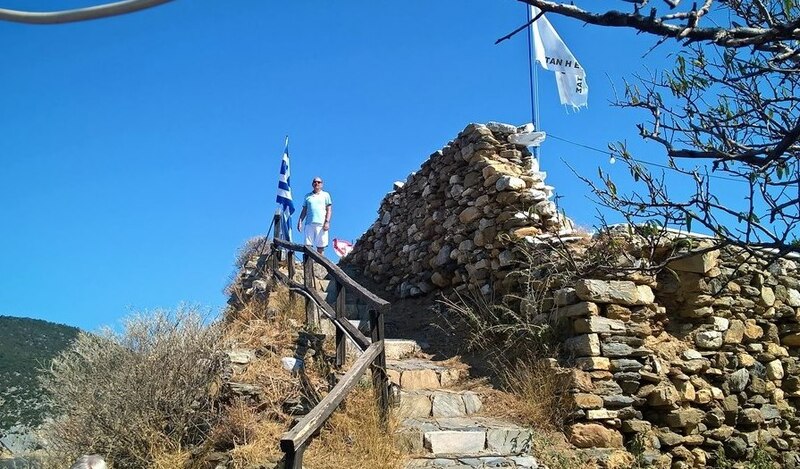 You will reach the remains of the wall of Venetian Castle if you continue upstairs from the white church Panagitsa. The fortress was built on the ruins of the ancient citadel and was repaired by Venetians in the 13th century. 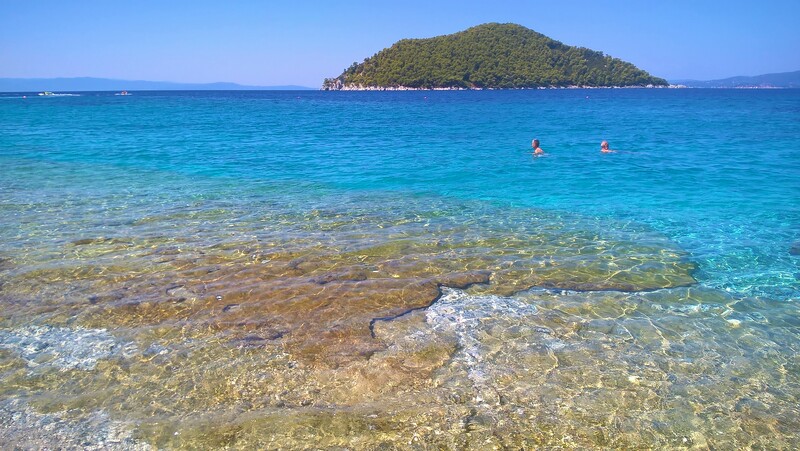 It is absolutely the most stunning, romantic place in Skopelos! Take good shoes because there are lot of steep steps leading to the chaple built on the top of the cliff! Slightly demanding to climb up but the view from top will take your breath away! The cliffs, wind, wild waves of emerald and blue sea composes an ambience one of a kind! No wonder that this place was chosen by film-makers of musical "Mamma Mia!" for one of the scene (wedding of Donna´s daughter)! 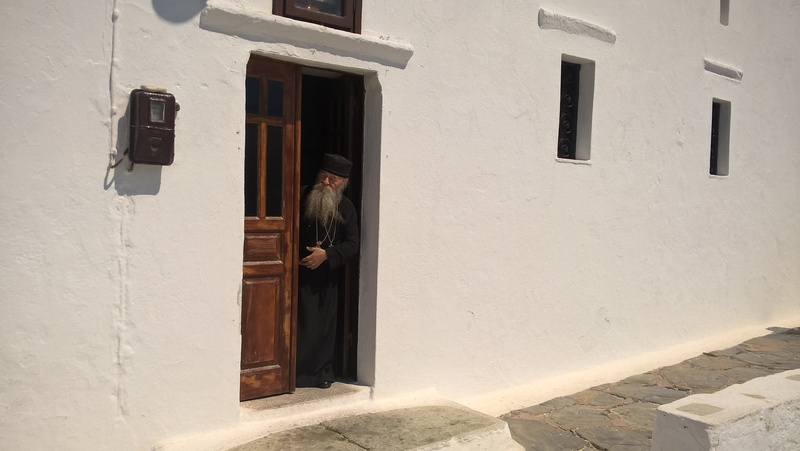 On the way up to Agios Ioannis chapel. Hurray, I am half-way! 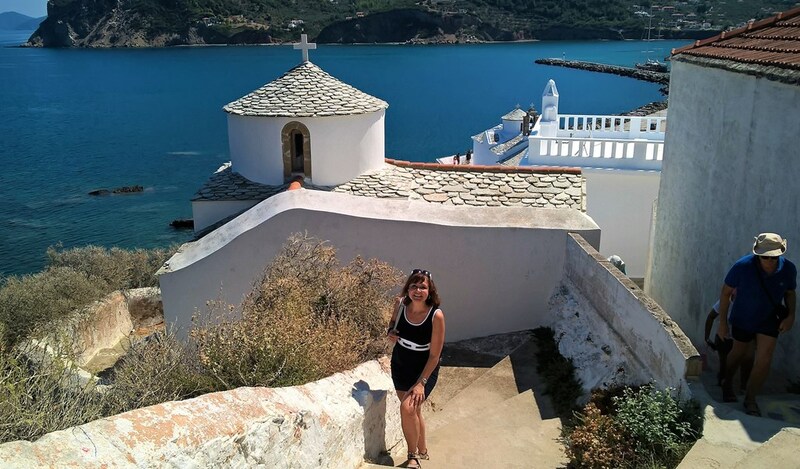 If you want to relax from the beaches definitely go up to the Mount Palouki to visit several monasteries and enjoy fabulous view to the Skopelos Town bay. The roadway leading to monasteries is narrow with a lot of curves, surface turns from asphalt to dusty and stony ground so the driver must be really good! 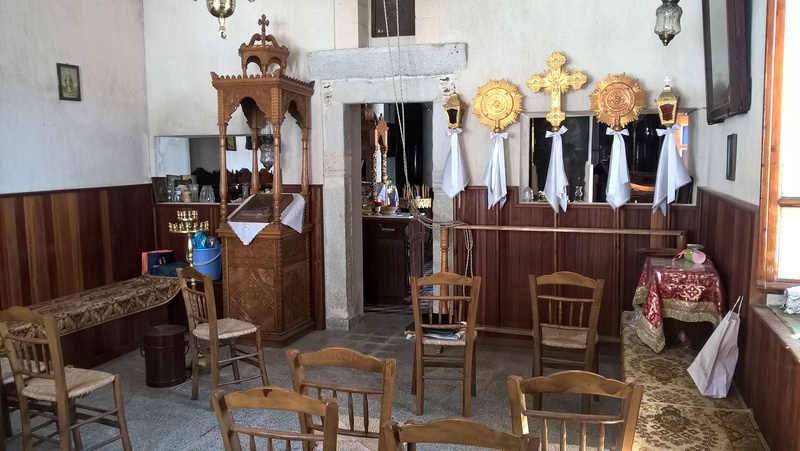 You can visit and see interiors of the monastery Evangelistria and Aghios Ioannis Prodromos. These two manasteries are the biggest. 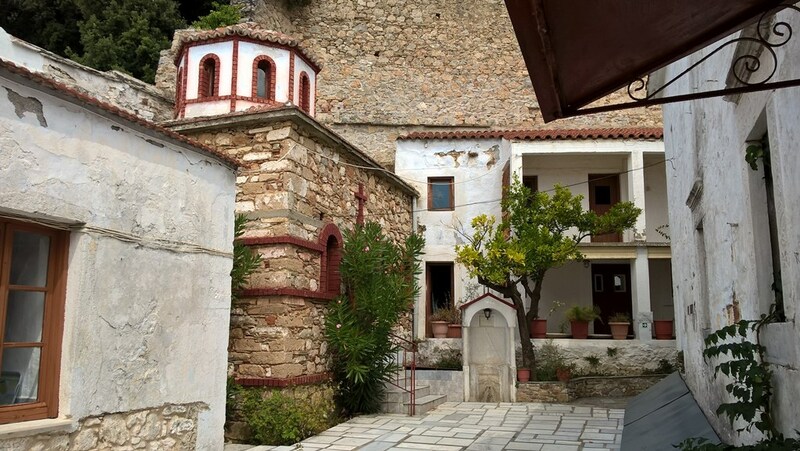 Other smaller monasteries (such as Sothiris, Agia Varvara, Agia Triadas etc.) you can see just from outside. 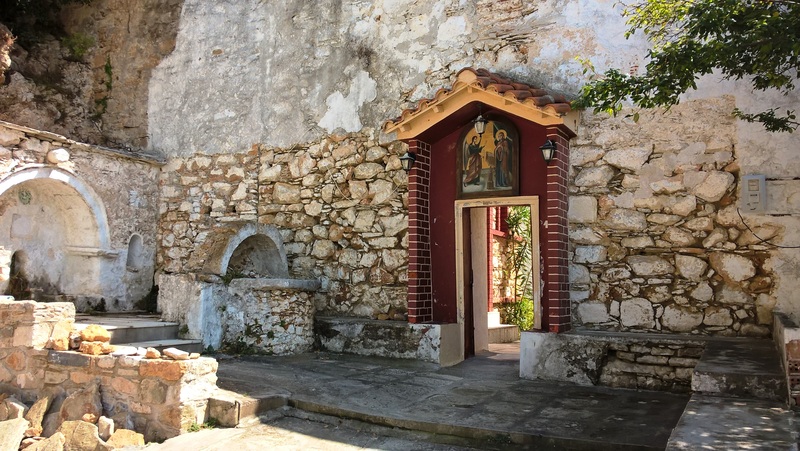 The entrance to the Evangelistria, the biggest monastery in Skopelos. 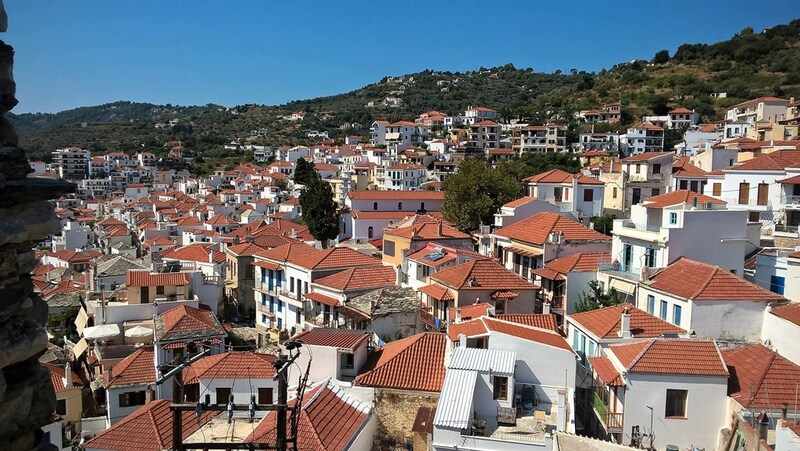 Located on the west of island, Glossa is the second biggest town (or rather village) in Skopelos. 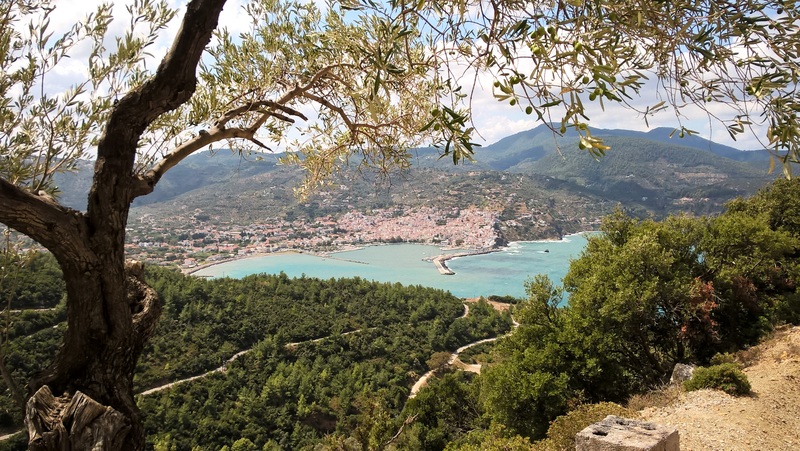 Surrounded by pine, almond and plane trees, the charming Glossa with its two-storey whitewashed houses was built on the mountain slope, 250 meters above the sea. Beneath the village is a harbor where you can go by ferry to nearby islands and isolated beaches. 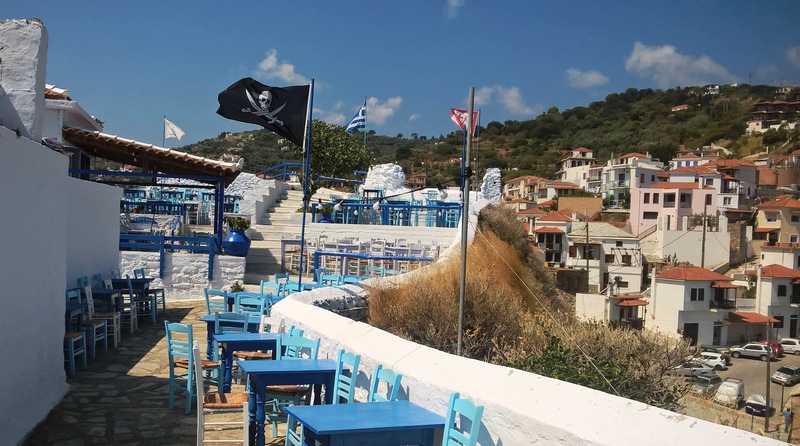 Muses – the most sophisticated restaurant in Skopelos Town, located in the quiet side street, waterside tables overlooking Town and the Harbour, high quality of food, very nice staff, brilliant ambience. If you sit outside and it is cold, you will get a blanket. Ampeliki restaurant – a family, non-touristic restaurant located at the quiet side street (near Muses), frequently visited by locals. Molos - a great view of the harbour, tasty local Greek specialties and fresh fish. Agnanti – up-market restaurant set up on the hill of Glossa Town. Prices are higher but worth the visit. The fantastic, unique view! To Louki Snack Grill Bar – located just a few steps below Ananti in Glossa Town; excellent quality of souvlaki and gyros for very reasonable prices.